Wedding dress alterations can be a really annoying, “forgotten” cost when planning your wedding. Shop around and ask friends for recommendations to their favorite local seamstress. Finding a skilled and experienced seamstress who doesn’t necessarily label themselves a “wedding dress” alterations specialist is the number one way to keep your alterations affordable. 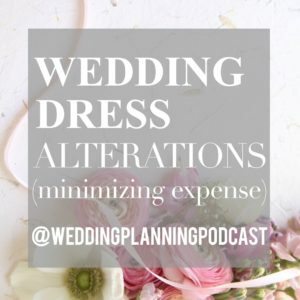 Tune in to the full episode to hear more of my top wedding dress alteration tips! 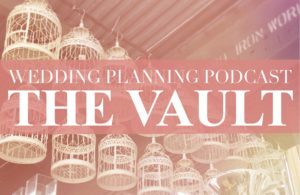 These episodes of the Wedding Planning Podcast have been archived, and are currently only available to members of The VAULT.